Nubian Heritage is the brainchild of two New York street vendors who grew frustrated by the inferior quality, high chemical content and exorbitant prices of products manufactured for people of African decent. In 1992 the lifelong friends embarked on a personal mission to produce high quality bath & body products, utilizing natural ingredients and traditional African recipes. Ten years later, most of the products are no longer made in bath tubs or kitchen sinks, but the Nubian Heritage philosophy remains the same; "Make the best products imaginable for our people, our family." 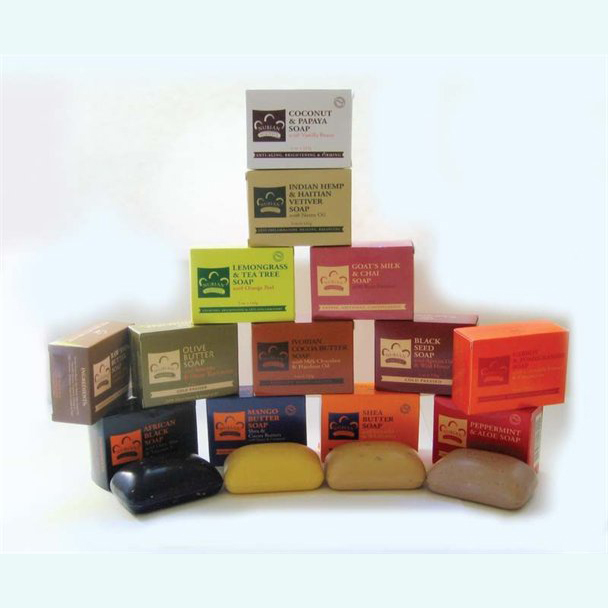 Shades of Afrika sells Nubian Heritage Bar soaps for ONLY $4 EACH....being the most competitive in price for a wonderful line of soap. Nubian Heritage "Indian Hemp & Haitian Vetiver Bar Soap with Neem Oil"